A carefree tropical paradise in the southern Pacific Ocean, Samoa offered us an ideal mix of relaxation and adventure. There are plenty of things to do in Samoa despite it being less developed than some of its island neighbours. Actually, its the natural attractions in Samoa, along with the friendly Samoan people that make a visit to this island group so special. We stayed on the main island is Upolu, which is home to the capital city of Apia. Of course there are plenty of beaches in Samoa, it’s a tropical island. However, this page is focused on activities. So, aside from visiting the beach, visitor’s favourite things to do in Samoa include swimming into a cave, jumping into a trench, visiting a famous author’s home, viewing waterfalls, shopping in markets, and feeding turtles. 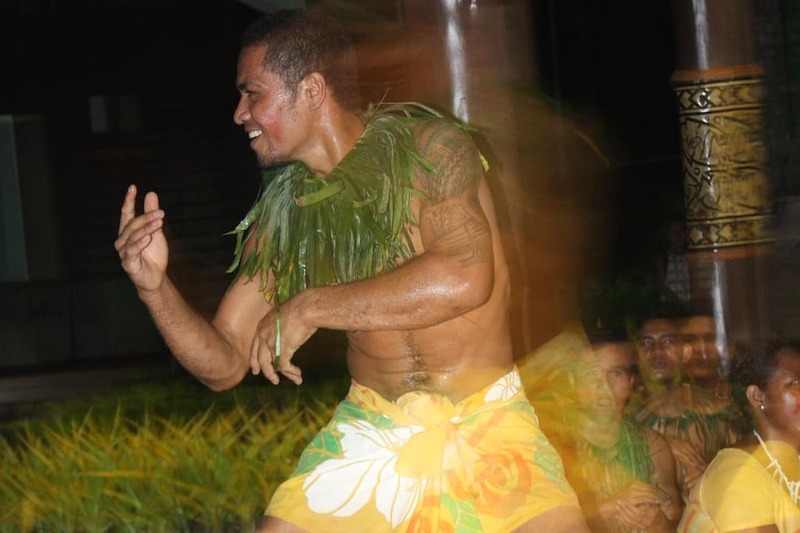 Listed here, in no particular order, are what we believe are the top 10 best things to do in Samoa, including a few that are well off the traditional tourist path. Important: If you are going to drive in Samoa, be sure to read the driving tips towards the end of this article. 13 Where will you start on this list of things to do in Samoa? Not well signposted, a GPS will make it easier to find the Malua turtle feeding pond. It’s not a commercial venue. Therefore, the turtles here are wild, yet used to taking food from people. There is no entry fee, although you will need to bring food. 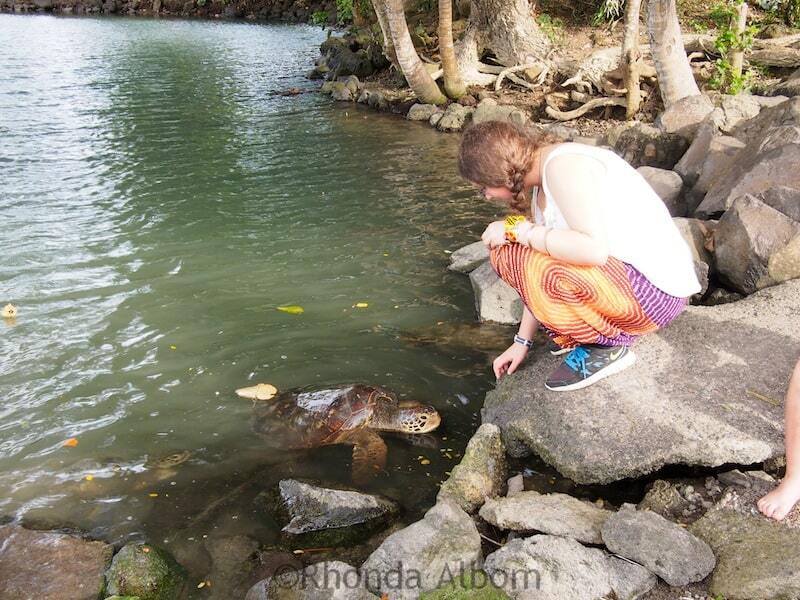 Our teen feeding a turtle at the Malua turtle feeding pool on the north side of Upolu. Robert Louis Stevenson spent his last five years in Samoa. He is buried on top of the hill overlooking his home. The rains were too heavy on the day we visited to make the hike to his gravesite. The guided tours of the house are frequent and informative. Stevenson is the author of Treasure Island and Strange Case of Dr. Jekyll and Mr. Hyde, amongst other great novels. Don’t miss Sarah’s photos of the Robert Louis Stevenson home. 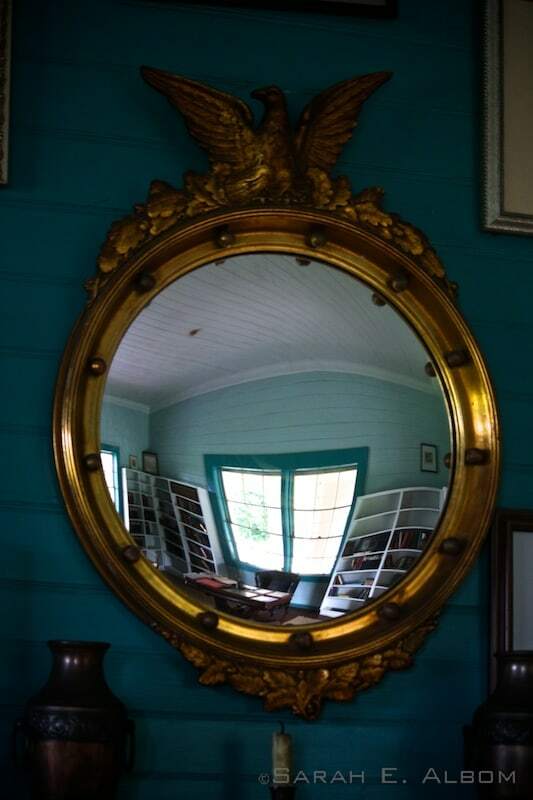 A mirror is reflecting the library of the Robert Louis Stevenson museum. These freshwater pools are loaded with colourful fish and pass under a church on the north side of Upolu. 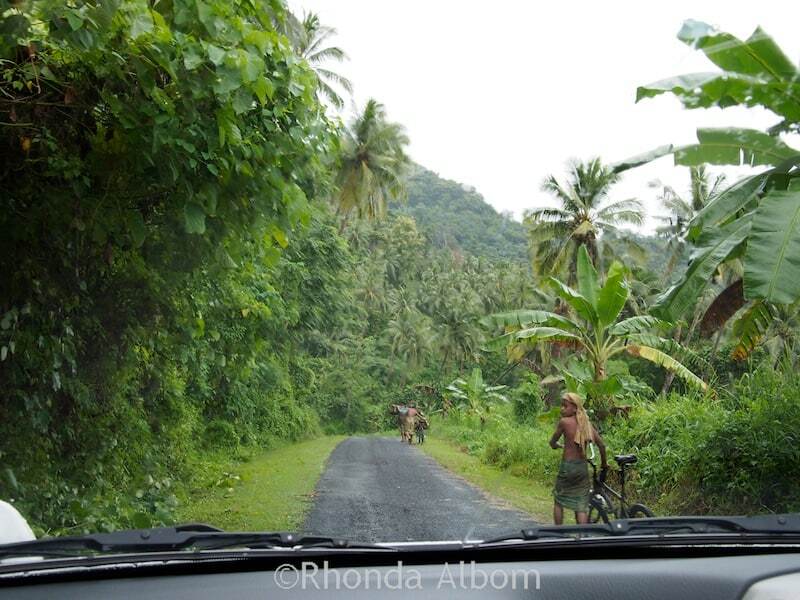 At the cost of only 5 Tala (about $2.50), it was a bargain and one of our Samoa highlights. Take caution on entry as some of the rocks are slippery. Also, the water is much colder than we expected. Swimming into the cave at Piula. *Piula Cave Pool is one of the six stunning water destinations visited on the Explore the Pristine Waters of Upolu Island tour. The Bahai Temple is another interesting and free stop. It is worth the visit if you are driving on the Cross Island Road (from Robert Louis Stevenson Museum). Be sure to enter both the temple and the visitor centre. The grounds are well manicured and full of tropical beauty. Plus, it has clean toilets. 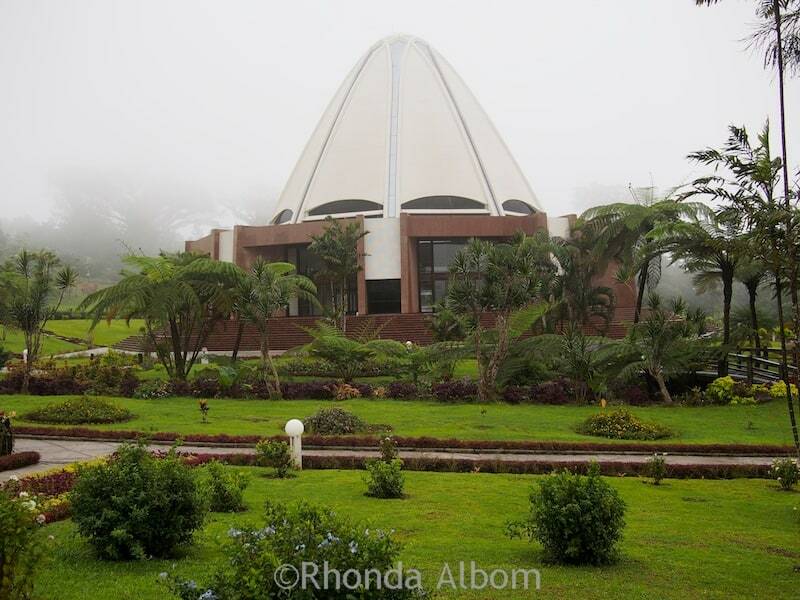 Bahai Temple in Samoa on a rainy day. Fuipisia Falls is located on private family owned property. Visitors to Fuipisia Falls pay a small fee to the family to view the waterfall. Through the family, we got a glimpse into the Samoan culture and what it’s like living in Samoa. It’s a short walk through the property, and we were escorted to the waterfall by the children living in the house. The two small boys took my hands and helped me across the stream on the way to the falls. This one is 7km off the main road and requires a 4WD vehicle to access. Less frequently visited, it is also a swimming hole. A series of cascading waterfalls separated by swimming holes, and surrounded by lush gardens. The island’s tallest waterfall (although I couldn’t find the perfect spot to get a photo). *Sauniatu and Togitogiga swimming holes are also amongst the six water destinations visited on the Explore the Pristine Waters of Upolu Island tour. Translated to English, To Sau means giant swimming hole. It’s more than that. 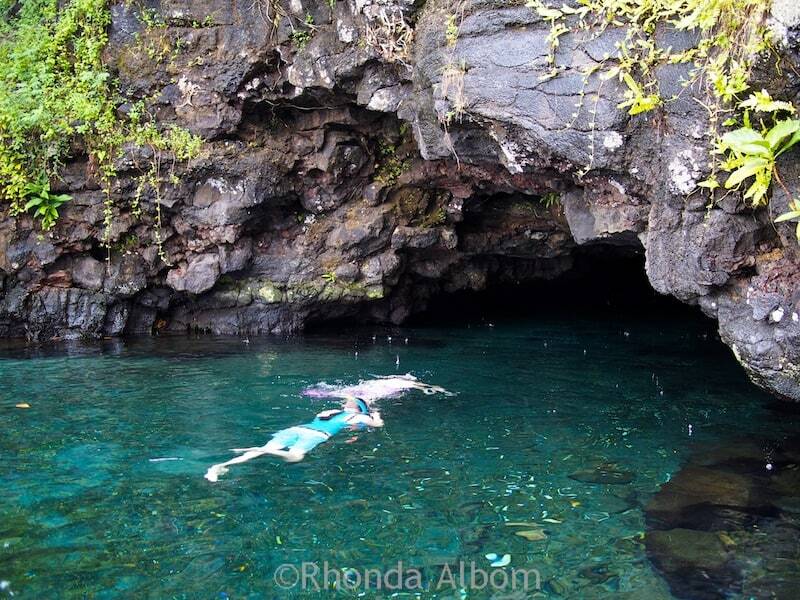 It’s the nation’s most iconic destination, comprised of two huge holes connected by an ancient lava tube cave that visitors can swim through. 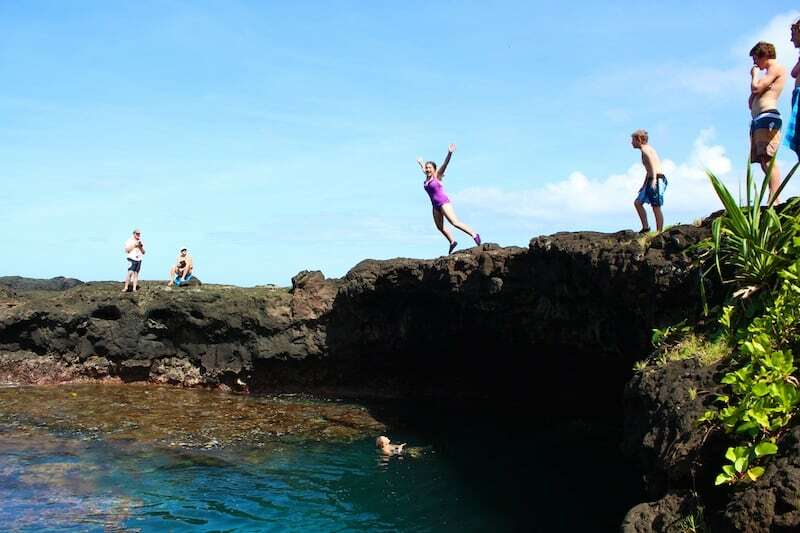 Personally, I skipped this leap, but jumping into the lava caves at To Sua Ocean Trench is one of my teen’s Samoa highlights. Look at her, she is fearless, like the rest of her group. ©Kelvin Kay 2014. Used with permission. *To Sua Ocean Trench is one of the six water destinations visited on the Explore the Pristine Waters of Upolu Island tour. Our other teen loves shopping and couldn’t resist getting a dress and a few other goodies at the Apia Flea Market. This is the spot to pick up your Pacific island souvenirs, clothing, and sarongs. It is filled with both locals and tourists, and is located right across the street from the main bus stop in town. Remember to negotiate the best price. **UPDATE: In Jan 2016, Apia Flea Market was engulfed in flame and destroyed. A new temporary flea market opened nearby. Apia Flea Market before the fire. We were only on the island of Upolu for a week and we spent a good portion of that time relaxing and enjoying the resort life. Therefore, we couldn’t do it all. Here are some of the Samoa highlights that we opted to missed, along with our reasons for skipping each one. Heavy rains while were there made the slide pools dangerous, otherwise, we would have given it a try. Both of our girl’s hold Jr. PADI diver’s certification and the best diving in Samoa is deeper than their certification allows. Honestly, we were too busy relaxing. There are plenty of options of where to stay on the island of Upolu ranging from luxury to a simple fale. We made a great choice and spent a week in tropical paradise at Saletoga Sands Resort. While our free standing villa offered everything we could want including an outdoor (hidden and secure) shower, it was the grounds and staff that really made this a perfect choice. Read our review of Saletoga Sands Resort. The resort we stayed at included a rental car in our package. Had it not, we would have used Rentalcars.com. We have used them successfully in other parts of the world, and to date, have always been happy with our decision. Drive on the left – back in 2009 the entire country switched sides of the road from driving on the right to the current left-hand side. Legally, to drive on the island, you need a Samoa license which is simply a validation of your driver’s license. I am not sure how many visitors bother to get the licence before they drive. Allocate extra travel time; speed limits are low. Take caution; there are frequently people, dogs, pigs and chickens on the roads. If possible, avoid driving at night. Local custom when approaching a pedestrian or another vehicle you intend to pass from behind is to tap the horn once. After you pass another vehicle, tap twice to say “thanks”, and the driver will typically reply with a tap. On the flip side (the anti-highlights), one of our girls required a trip to a Samoa hospital due to a bug bite. While the hospital was shockingly affordable, we were glad to have Travel Insurance with World Nomads. In fact, we don’t leave New Zealand without it. *For our Canadian and US travellers, unfortunately, due to financial services laws, we cannot provide a discount. 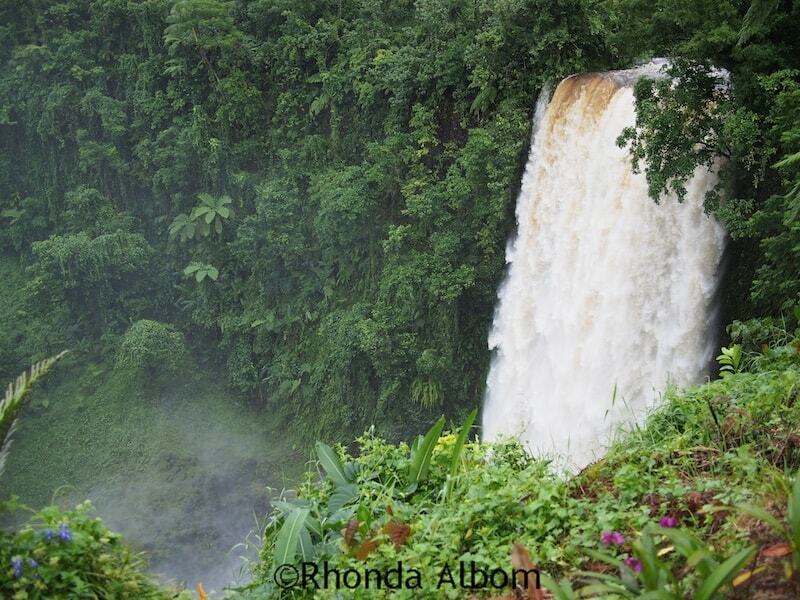 Where will you start on this list of things to do in Samoa? Samoa sounds like an amazing place. I have never heard of it before reading this post. I would love to do some turtle feeding there. Samoa is one of the island nation in the South Pacific. It’s a popular vacation destination from New Zealand. I love your pictures and tips about Samoa. I am tempted to book a ticket to visit. It will be a long journey to get there as I am leaving from the UK. What will the weather be like? I am going in March and have about 18 days. Is that too long to spend on the island? I will be on my own so I am mindful about the cost of accommodation. I do not want it to bankrupt me. Your advise would be really helpful to make up my mind of going or not. I would really like to relax on the beach for most of the time to adjust my body clock first and possibly hire a car. Samoa is quite close and affordable for us as we live in New Zealand. It is a tropical island. If I was coming for the UK for only 18 days, I am not sure I would want to spend them all on Samoa. There are other wonderful island groups like Fiji and the Cook Islands worth exploring as well. I visited Samoa in April of 2016 and found it to be the most amazing place – the scenery, way of life and people are all fantastic. It’s on my list to return also, and I live in New Zealand, it’s not so far away. Lovely photos. Waterfall was gorgeous. 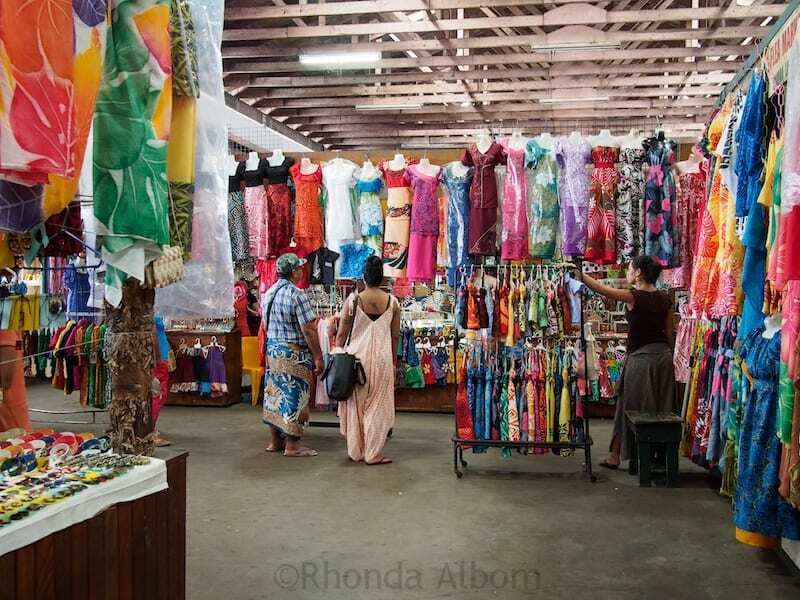 I could spend hours in the market – such colourful dresses 🙂 Thanks for sharing! Love the typical road scene photograph. Looks Idylic. I would go crazy in that shop with all those sun dresses! I love to wear them. Like wearing pajamas in public. My teen bought the one with the darker red skirt and black top – third from the left on the back wall. Hi awesome travel info great shots! Thanks Lynn. I knew I couldn’t stay here for an entire year. I miss winters with you, although I will admit, I don’t miss the snow. What great shots of your visit. It’s fun to travel. Hubby and I are so ready after we get done with all this volunteering. I’m sure that pool would be so fun and refreshing!! Love the turtle. Rhonda, I don’t know which one would be a highlight…all of them. The feeding the turtles to jumping off the rocks. Now, I just want to do it all! Thanks for linking up to Weekend Travel Inspiration! Let me know when you are heading to the South Pacific. It would be cool to actually meet in person. Thanks for visiting TravelnWrite in the Weekend Travel Inspirations link. I found your wonderful blog as a result of the comment you left! Hope you’ll be a regular at our blog and I will be back here as well. Some great photos. Feeding sea turtles would be so cool. The turtle photo was also my favorite! Looks like a great adventure was had by all! LOL, there are no great shots of me feeding the turtles, as they freaked me out a bit as the pulled the papaya straight out of my hands rather than taking a bite. Turtle moment, lovely. Lion rug not so much.